I have probably walked by this building, Five Lusk Street, a couple hundred times in my years of working in SOMA. I have never, until last week, looked at it from the back, where it becomes apparent just how strange a building it actually is. From the front? Looks like a perfectly normal if ugly building. From the side? Ditto, or possibly double-ditto. But from the back? This is a condo. A 2300-square-foot condo. The end is too narrow for a normal door. And it might just be the ugliest dwelling I’ve ever laid eyes on. Not a single redeeming feature. 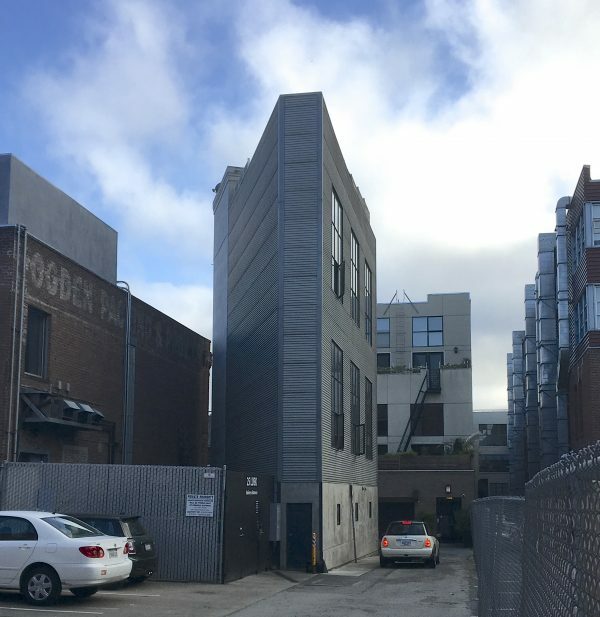 This entry was posted in Sunday Switchup and tagged Architecture, SOMA. Bookmark the permalink. This one, though, was built well after that. There must be something, either somehow the owner only ended up owning that triangular piece of land or there’s something on the back of the brick building that can’t be built against, or there’s an easment on the property, or… I dunno. Just weird.